Go West young man. Not sure who said it, don’t rightly care, to the north was big business and damn Yankees (spits tobacco on the ground). The South held no love anymore with the end of the war and the grief like a chocking wind hanging over everyone. The East had plenty of business opportunities, but there are too many people who know my name and my face and enough who would try and collect the bounty on my head, so West it is. I’m not sure how this journey will turn out, but I’m going to try a few different things along the way. 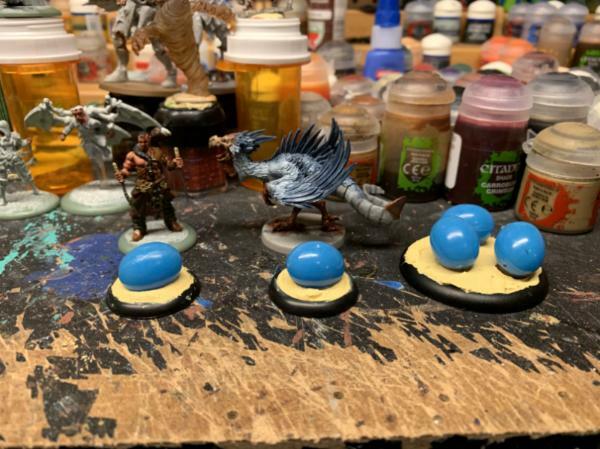 I have done multiple threads in the Painting and Modeling forum, all of which just wind up being a hot mess of “Stuff”, different game systems and models running together and tripping over each other. This thread I will try and keep as clean and wholesome as a preachers daughter . Along the way I’m also going to try and keep track of vendors of cool merchandise related to this journey, helpful videos and tutorials which might prove useful for tenderfoots, and just give shout outs to movies and/or shows that helped inspire my progress. This first post might get long as I keep adding to it, so help me to organize it with any suggestions y’all see fit. For those who don’t know me, I’ll give a quick run down (as of December 2018). Born And still living in St. Louis , MO (the gateway to the west ), I have been gaming since I learned to read and write, age 4 as my brother and his friends needed another player for their D&D campaign. 40 years later I still mess around painting and building stuff, never having become a master at anything game related. I have plenty to still learn and I love demonstrating what I have found if I think it can be of use to anyone else. I rarely get to play anything as I have a 15 year old daughter and twin 13 year olds (one boy one girl) a wife who is a teacher and I work at a hospital full time as a janitor and also at our church. My funds are limited, so instead of buying fancy MDF kits I’ll be building most of my towns with craft sticks and found items. The best part is I tend to share where I find treasures, so others don’t have to go prospecting for their own gold. My version of Blackwater Gulch will not likely be like anybody else’s, which I think is the real draw of a small skirmish game. Everyone can create their own little corner of the Wild West and set their own ideas about it. After all, there were plenty of stories about ghosts and monsters, heroes and villains, good and evil, what we know for a fact today is not what they knew for sure back then. History is told by people who have only half the story at best, and that story has been sanitized many times over the years to make it suitable for each generations political correctness. Throw in a helping of the macabre and make myths and ledgends real and that’s what I hope to bring to the tabletop. I grew up watching the Lone Ranger, F-Troop and Bonanza for Wild West action, but I also loved shows like Buck Rogers, Battlestar Galactica and The A-Team for their adventures and heroism. Cartoons like Robotech, Dungeons & Dragons and M.A.S.K. gave me crazy ideas of what could be and inspire me still today to build. Hopefully I can bring all these aspects and more to my tabletop and I hope it inspires others to break out their inner child as well. Keeping an eye on you lad. Thanks Cam , I need lookin after while I git ta driftin West. Made some fence sections. Nothing fancy, just stacked criss-cross fencing used in the west. The horse behind the fence looks tall, but it’s the Test of Honor base which is pretty thick that it rides on that brings it up. If the fence sat on the same base it would be up to the horses neck. Each section of fence is 3” long and roughly 1” tall. In front of the fence is a crate made from wood sticks I picked up at Walmart. 75 sticks for $2.70ish, it’s the main piece that I’ll be using for all the projects. The fence rails are another wood piece from Walmart as well. 50 for $0.70ish cents. The barrel which has been given a coat of minwax early american 230 stain comes in a pack of 9 from hobby lobby for$1.99. They are 7/8” diameter mini pickle barrels from woodpile item #165175 and make great scale pieces for cover. 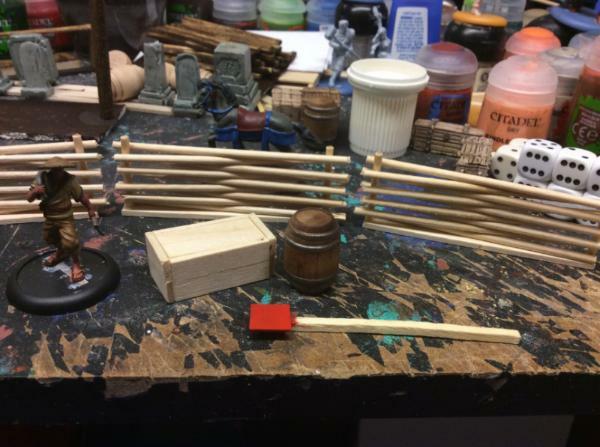 The little red square which is temporarily attached to a stick for painting will be a checker board to rest on one of the barrels as was suggested by a friend in my main thread, I’m just waiting for my eyes to cross enough to paint tiny squares . Productivity today is only in staining the barrels and three fence sections. Hopefully I won’t be wiped out tonight when I get home from work. 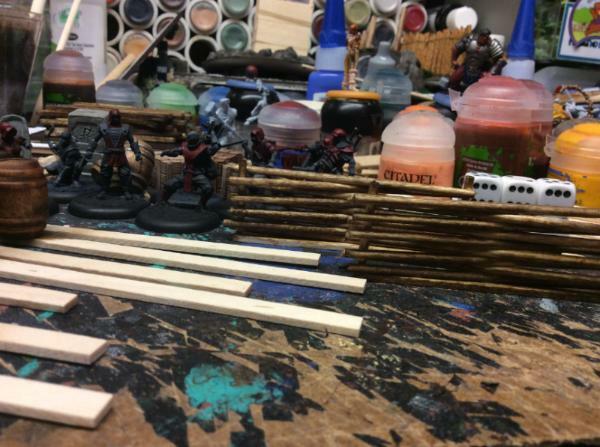 Plenty of fence sections to build and barrels which need their hoops painted metal. Also needing some boxes made, nothing fancy. Lots of housework this weekend on my weekend off, we are hosting Christmas here and the basement needs to be accessible to the kiddos. I need to find some of my goodies that I have tucked away in order to start building the town. Looking great so far. I like the fence idea. 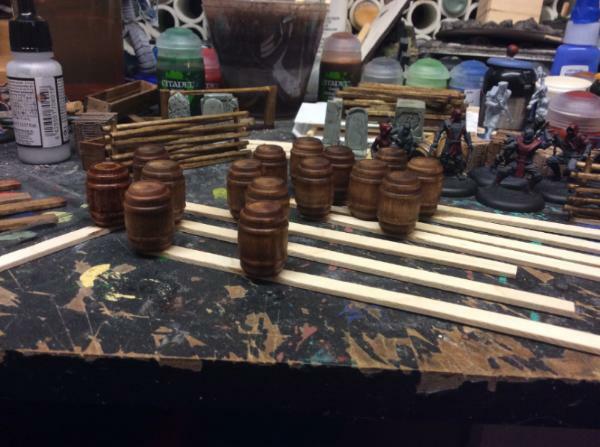 I have a whole bunch of mantic terrain creates for barrels and crates, and lots of other scatter terrain and objectives. I hope to paint them..... some day. Well I decided to try my hand at making a gallows. Kick out the barrel and watch them drop. I like the look of this project. Reckon I'll follow along. Heck, you might inspire to to finally work an my BWG stuff. 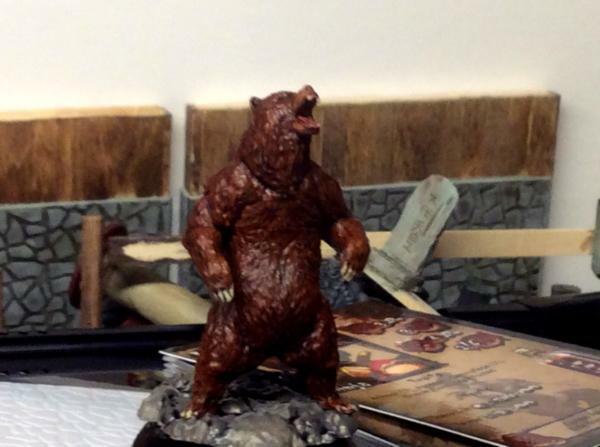 Now showing Northern Alliance ice trolls and some scatter terrain! 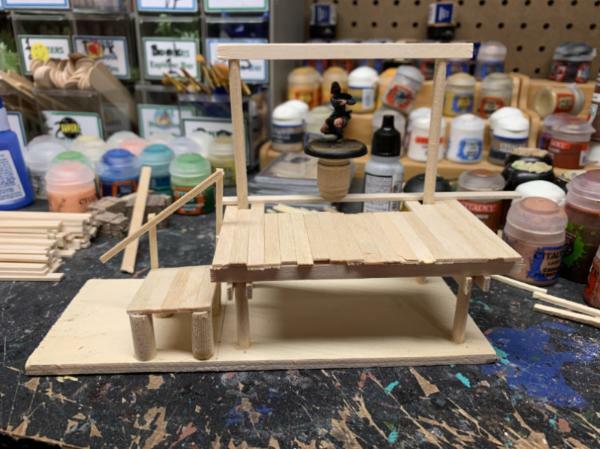 Painting total as of 4/7/2019: 43 plus a wooden bridge and gnoll encampment and 28 pieces of Mantic scatter terrain and three fly holes and a house. 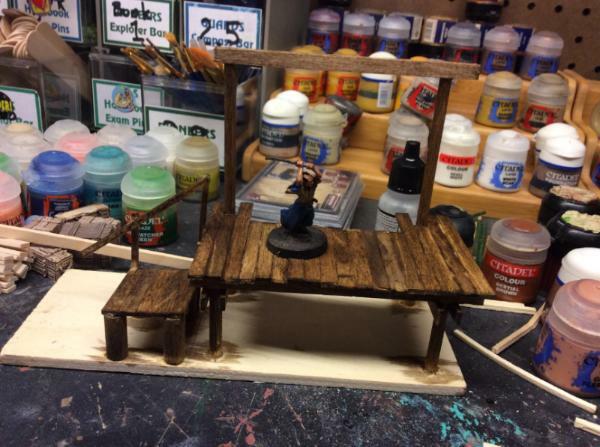 Stained version of the gallows. Think I’ll hit it with some sandpaper and maybe a Nuln oil wash. Bored and not sure what to do at 2a.m. When I’m totally awake , I reached into my piles of stuff and found something that I had no intent of ever painting, but decided “what the hey!”, I’ll leave you with the clue. Can’t figure out how to link the gif . Time to sleep. 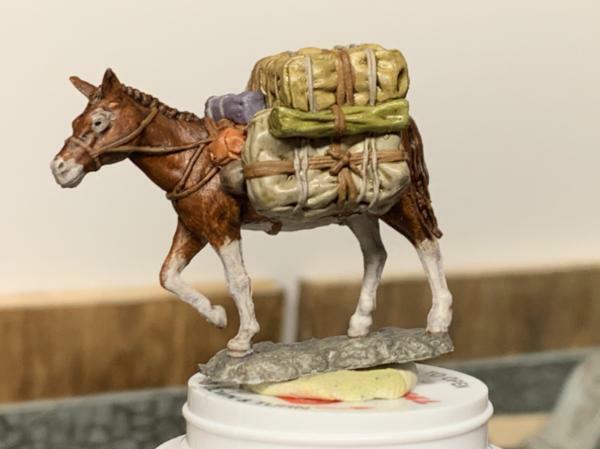 Not an official Blackwater Gulch figure, but I have a strange idea for an objective, catch your own dinner. 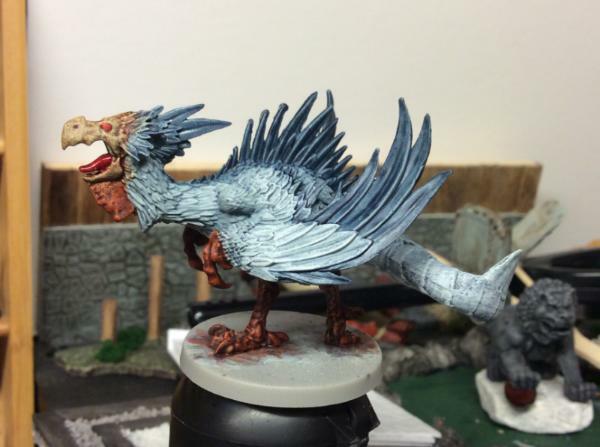 It’s from the CMoN Massive Darkness expansion “Noble Warriors VS the Cockatrix”, I’m thinking of getting a second....and third to make a riding mount and pack chicken . No one would screw with a prospector who has a pack chicken he names “Dog”, would they? How about a mission where some outlaws are trying to rustle some giant chickens instead of horses, and the lawmen have to stop them? Just back from Miniaturemarkets retail store. 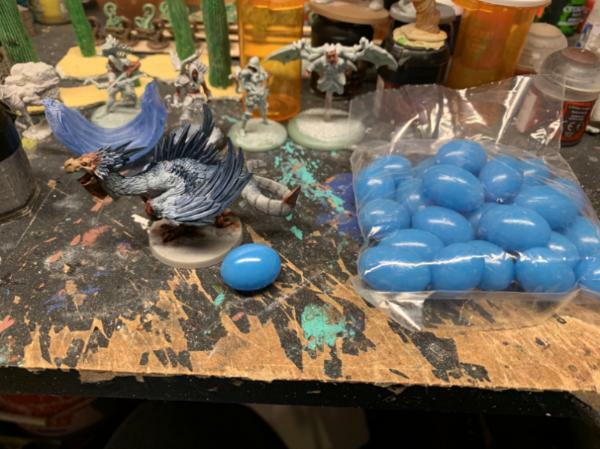 As most of my supplies come from there, Kickstarter or my FLGS gameniteshop.com, and having been sick this week I was getting a little stir crazy in the house, and I never had the GW red and yellow washes, so I had to rectify that calamity. Current state of the bird. I’m going to swing by HobbyLobby this week and see if I can’t find some scale sized eggs to make a clutch for this bird. I remember a story on the news about a restaurant in Texas where they made ostrich egg omelets. I think that might be a thing at the local tavern. Also some tentacles from the others. Crazy things are on the loose near my town. Good thing I have a large lawman faction coming soonish. Maybe they can keep the peace and steer the likes of the serenity freight crew away from town. Having grown up watching little house on the prairie, I’m thinking of building my boomtown based on Walnut Grove. Olsen’s merchantile, Hanson’s mill, post office with Dr. Bakers office around back, church/school house, Caroline’s restaurant (with big bird omlets) and maybe even a school for the blind. I’ll have to bring a lot of craziness to it so it may become more of a twilight zone version of it . 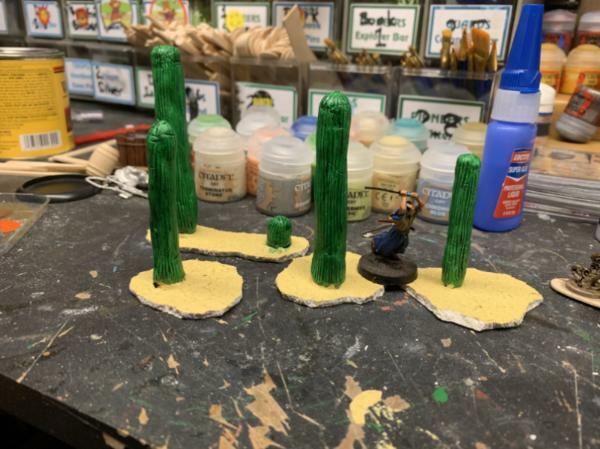 Tried my hand at making some really large cacti. 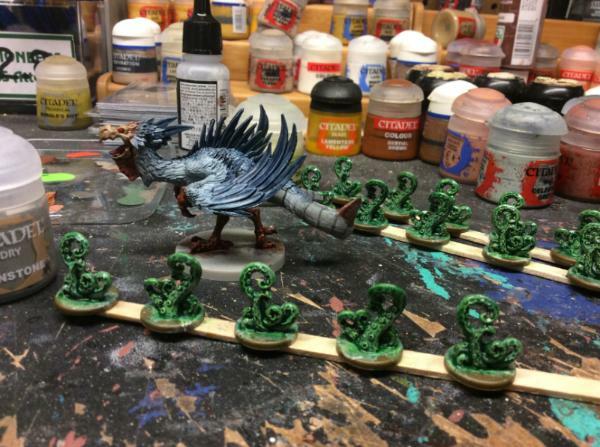 Added sand to the bases and another was of Biel-Tan green. I’ll probably make some smaller ones with arms later, these are more of the spear variety(armless). While doing quick research on the cacti I found out that these grow huge. I mean HUGE, like 40+ feet tall (13meters for those inclined) with the record size of over 70’ tall having been destroyed by a windstorm in 1986. So these being 3” are actually rather small because they would scale in around 15-20’. 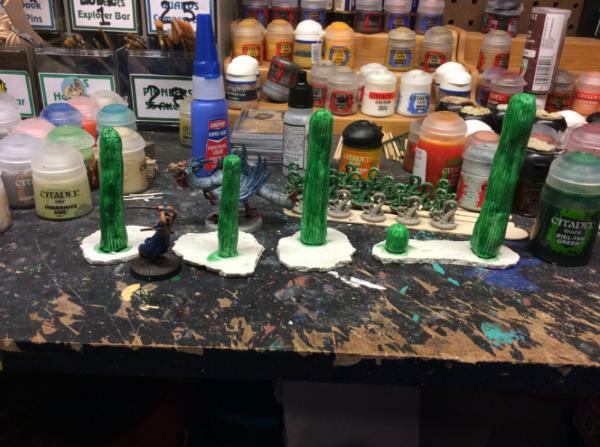 I need to take an updated picture of the Cacti as I gave them a drybrush of underhive ash GW dry paint. Also a little shopping was done yesterday as I saw a few things to fill out the board. Deep Cuts oxen....because who doesn’t need some oxen in the Wild West. , after all they can be rustled, herded and mutilated as objectives . 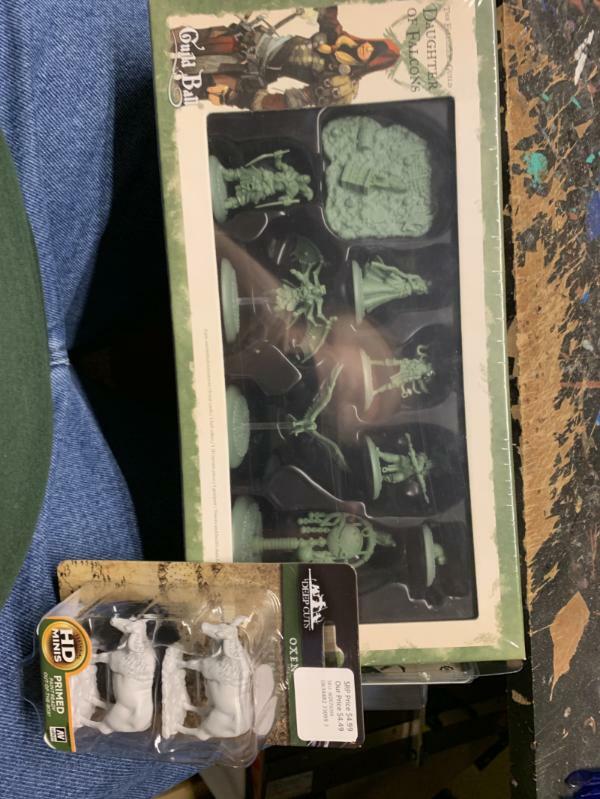 Also grabbed a set of the daughters of the falcon by steamforged games. They look like I could make the figures into some native Americans with attitude, also there’s a cutesy little flop eared bunny , which was pointed out to me last night is used a song the ball in their game . A large eagle figure chasing down the prey bunny, nd a British steampunk inventor with flying wings....because cool. Thanks Necros , having primed them all I think each of them could fit nicely into my game. Also painted for a few minutes today. So I can introduced Russel (dark one) and Stewie (white with spots) Bovierie, just need to base them up. 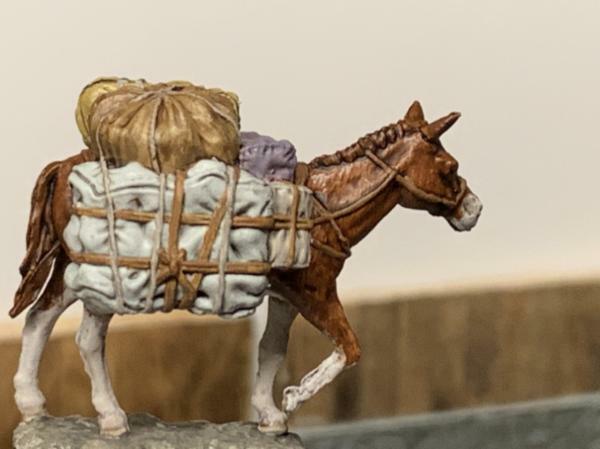 Currently they are unbranded as I’ll need to come up with a cattleman for my town, although I could call them Serenity and Firefly and have them pulling the big weird wagon for the serenity crew . That may need to become a thing now . 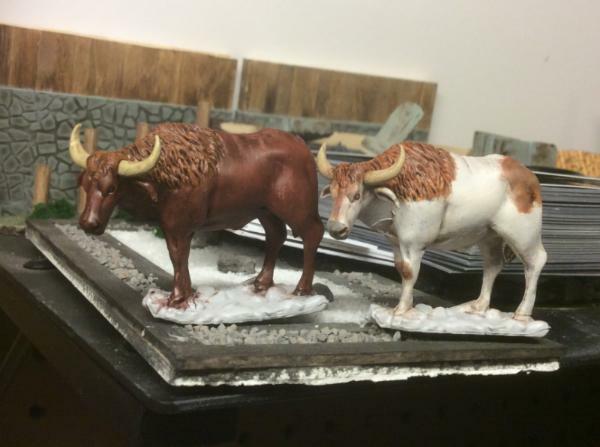 Also Wizkids Deepcuts (who made these oxen) have Wave 7 releasing now. I have a two pack of pack mules and a grizzly bear on order. Oh and after I posted and moved stuff on my desk this happened. 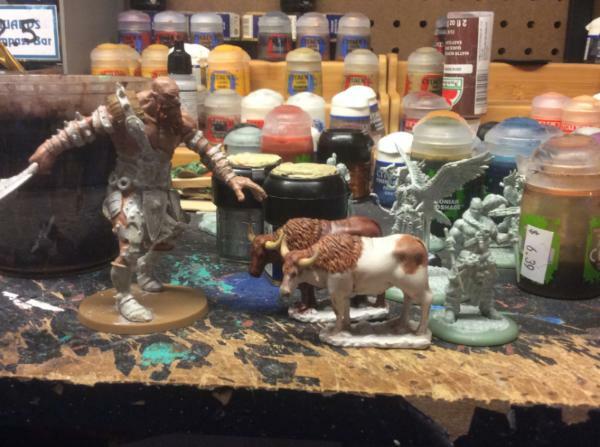 It at least gives a good idea of scale for the oxen and the Guildball guys. I have a second one to do, but it can wait a while. A deep cuts medium air elemental, it’s translucent clear then given a dry rush of brown and a Agrax earthshade wash. Just seemed like a fun little dessert thing to make. 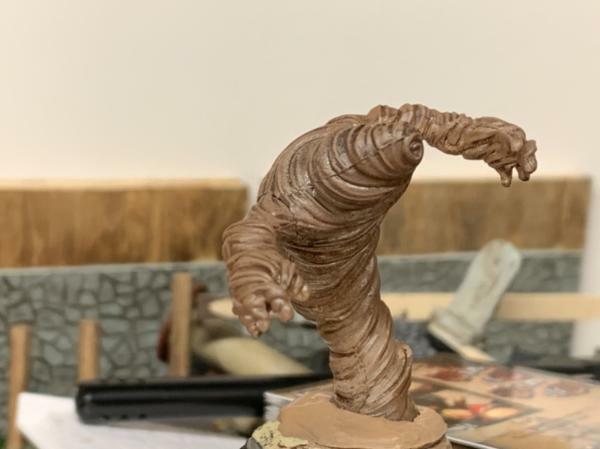 I was actually thinking of adding a similar Dust Devil creature to the game.. or maybe call him the Sandman? Call him mr Hoover, cause he’s Dam good at sucking things up. Catching bullets and redirecting them would be cool, but get blown up by explosives. Was walking through the pet department at Walmart the other day and saw these glow in the dark pebbles for fish tanks. Immediately thought of my terror chicken. Once I got them home I realized either they are A. Too big B. The terror chicken I have made isn’t fully grown or C. The reason why the terror chickens look so scary is because they lay eggs this FREAKIN large, I know I’d squawk really loud if that came out of me. Decided to make some objectives with them.